A widget that produces an scrollable area into which widgets can be embedded and custom drawing done. The width of the layout in pixels. The height of the layout in pixels. More substitution strings are to be added. The Gnome desktop has a "system tray" which functions as notification area and generally contains transient icons that indicate some special state. For example, a system tray icon would be displayed to notify the user that they have received new mail or an incoming instant message. 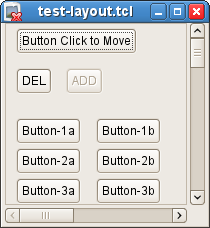 Reference to the Gtk+ documentation will describe this object as a Gtk+ Display widget. As this item relies upon resource not contained within the core Gtl+ intallation and may not be a cross-plaform feature, it this item is contained with the GnoclGnome package. Add child widget specified by widget-id to the frame. Horizontal placement of the widget within the layout scrollable area. Vertical placement of the widget within the layout scrollable area. Move child widget specified by widget-id to a new position within the layout scrollable area. Remove the widget specified by widget-id from the list of child widgets contained within the layout..
Deletes the layout widget and the associated tcl command and all child widgets.